“We try to have fun, but also keep what we call our ‘final destination’ in mind, which is to make sure we put our players in the best position to succeed and ultimately graduate,” Coach Pena said. Click here to hear Coach Pena on “New York Sports and Beyond” in its entirety (starting at the 28 minute mark). Coach Pena was promoted to Head Coach after serving as the Associate Head Coach for the 2016-2017 season, during which the Berkeley Knights earned their third consecutive United States Collegiate Athletic Association Division II National Championship. Having played for the Berkeley Knights from 2006 through 2009 himself, Coach Pena knows the challenges his players face while trying to balance the demands of basketball, academics and family. 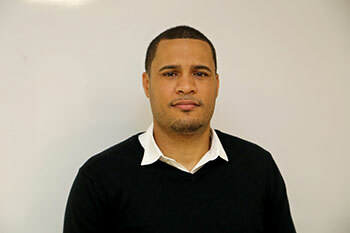 Coach Pena graduated from Berkeley College in 2009 with a BBA in General Business. He juggles his responsibilities as Head Coach with his professional career as a CRM Manager at The Weather Company, an IBM Business. “It is a little difficult to balance it out, but when our guys go on to graduate, it helps put things into perspective,” he said. Equally important to Coach Pena is providing opportunities for the Berkeley Knights to give back to their communities. Most recently, players and coaching staff volunteered in non-competitive basketball activities for children and young adults with disabilities, organized by Kids Enjoy Exercise Now (KEEN) New York. Click here to read more about the collaboration with KEEN. The Berkeley Knights’ record thus far this season is 14-1. Click here to view the team’s entire game schedule.